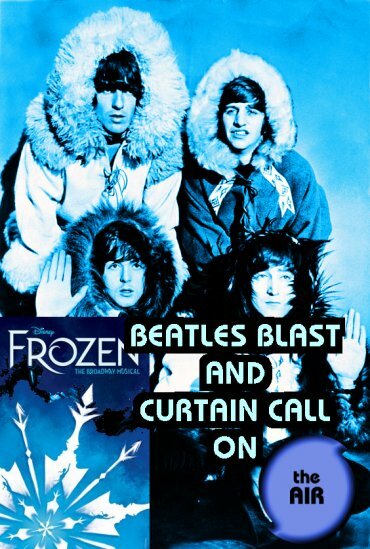 The Beatles and Broadway Attempt To Warm You Up Wednesday. In the morning, following our regular 7 AM replay of the previous day’s episode of The Swing Shift, we will bring you up to date with Prognosis at 9 AM and Psychedelic Shack at 11 AM. At noon tune in for Word Association iwth Lee & Rudy, followed by 90 minutes of The AIR Music Mix. All times listed inthis post are EST, by the way. At 2 PM it’s a new episode of Beatles Blast that really should have been some kind of tribute on the fiftieth anniversary of the famous “Rooftop Concert,” but since I forgot all about that until this morning, it’s a one-hour mixtape of random Beatles goodness, with two songs each from the band, and two each from each member of the band performing solo, plus some surprise covers. Just because I forgot to commemorate the Rooftop Concert, that doesn’t mean I can’t tell you that the film that featured it, Let It Be, is finally going to be released in conjunction with a newly-assembled documentary using 55 hours of previously unseen footage from that film, only this time edited by Peter Jackson. Also, you can read about the rooftop concert in a book I wrote about HERE. Beatles Blast offers up a new episode every Wednesday at 2 PM, with replays Thursdays at 9 PM, Saturday mornings, and Sunday at 5 PM, exclusively on The AIR.